Balls are usually not the most attractive shape for food presentation. Partly because you don’t really know what’s inside them, they’re hard to share and they end up having the same colour when cooked. But what if balls actually tasted like what a menu said? Imagine pork, fennel, sage and orange or chicken, pistachio, muscatels and parmesan. What about adding creamy polenta and tomato sugo or pesto and Italian beans? 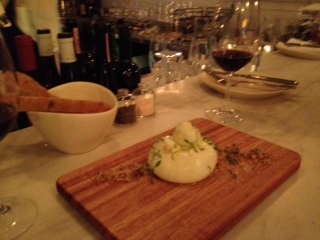 For entree think of a giant burata- a fresh Italian cheese, made from mozzarella and cream. The outer shell is solid mozzarella while the inside contains both mozzarella and cream, giving it a super soft creamy refreshing texture. Wine doesn’t come in round bottles, but in beaker-shaped ones that have a good range of Italian varietals like the soft, tannicky Montepilciano. As the staff will tell you – They’re all about the balls! Thank you so very much for your lovely review! We are all about getting people to love our balls. Hope to see you in again soon!